It started off from a simple WhatsApp message: "Wanna go Korea?" Within the next week, my best friend and I found ourselves searching for flights, booking accommodations and before I knew it, we were back in Seoul! There wasn't any proper itinerary planning because we've been to Seoul a couple of times and have visited the 'touristy' areas such as Gyeongbokgung Palace, N Seoul Tower, War Memorial of Korea, Bukchon Hanok Village, so this trip was more of a short getaway to relive our memories in Seoul. Anyhow, here are some of the things we did and places we covered this trip - nothing too touristy, just hanging out in Seoul like the locals would! I categorised them according to places to visit or activities to do in different areas of Seoul just so it's easier to read. 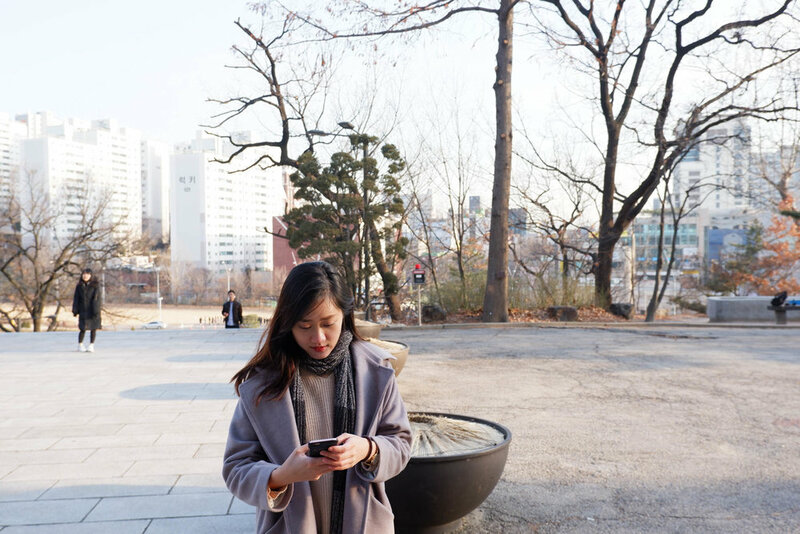 Our first stop was to take photos with the gorgeous Ewha Womans University! The university is a pretty popular spot for photos and OOTDs because of the gorgeous architecture. On a side note, we look fine but really we were freezing in the 2 degrees cold air. With my best friend, Charlene! Charlene highly recommended Huku Sushi as it was her "favourite sushi in Seoul!" Personally, I didn't enjoy the sushi as much since there was too much wasabi. However, I really liked the avocado rolls (11,000 won / SGD$13) and that's one dish I would recommend. The price starts from 15,000 won (SGD$18) for 12 pieces of assorted sushi - so I don't recommend splurging at Huku Sushi if you're on a budget trip! 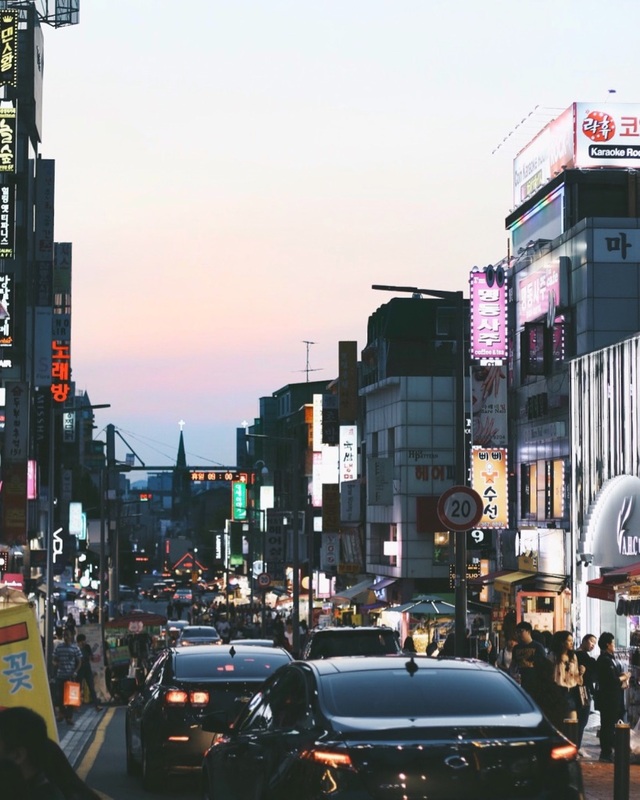 The area around Ewha Womans University is one of the most popular shopping spots in Seoul. Streets are filled with clothing store mostly catering to women since it's near the women's university. I didn't pack much clothes for the trip as Charlene and I had plans to go shopping for winter clothes in Seoul. We went to Ewha at least three times during the trip and each time we ended up bagging lots of clothes back to our Airbnb! The korean-drama-looking big coats that we wore this entire trip were also from one of the stores in Ewha! Shopping tip: HAGGLE as much as you can! We got our coats in Ewha for 40,000 won (SGD$49) when they were originally priced at 59,000 won (SGD$73). That's more than 30% off! Oh, another place I highly recommend for shopping would be the Gangnam Station's Underground Shopping Center, which might be a little out of the way if you're staying in Hongdae area like I did, but I promise the clothes can be quite a lot cheaper than in Ewha, Hongdae or Myeongdong. Also, we noticed that quite a number of photo booths have also popped up everywhere along these popular shopping areas and of course, we had to take some photos the old school way. You can get these vintage prints at about 4,000 won (SGD$5) for 4 strips. Have you really been to Myeongdong if you didn't take a photo with the iconic giant LINE bear in their biggest store in Seoul? I've been here twice and both times, I had to take photos with the most popular bear in Myeongdong! There might potentially be a snaking long queue of tourists wanting to get a photo with Brown, so it really depends on your luck. They also sell really cute and affordable knick-knack that would make great souvenirs for your friends so check it out if you can! Another iconic store to visit in Myeongdong would be Stylenanda's concept store "Pink Hotel". The entire 6 storey store is designed to resemble a hotel - except it's filled with lots of apparel as well as cosmetic products from their skincare line, 3CE. Their beauty products always come in such adorable packaging! But they're also pretty expensive lol. I can't believe they have an actual bed AND beside table hanging from the ceiling! Isn't it gorgeous? It was pretty cold the whole time while we were in Seoul and we found ourselves running into stores just to get some warmth. Naturally, we spent some time in coffee shops - away from the cold and having a warm cuppa. 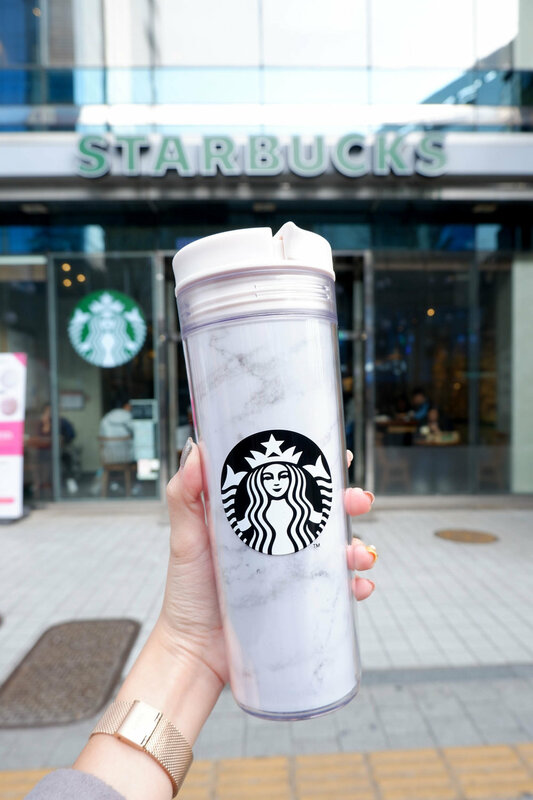 We also went hunting for Starbucks outlets to get my limited edition Starbucks marble tumbler, yay! Hongdae is a world of it's own, really. Rows and rows of shops selling food, clothing, beauty and skincare products - it's got everything! Our Airbnb was just a stone's throw from Hongdae so we spent a lot of time just shopping and hanging out there. Something I learnt while battling the cold: any kind of piping hot snack would taste amazingly good during winter! There are lots of street food stalls in Hongdae and you can literally snack while shopping - the best of both worlds ain't it. One of the things we tried (and I managed to take photos of before gobbling down the food) was Zizi Jianbing - customisable savoury crepes with ingredients like cheese, egg, bacon chicken etc. It tasted great but was unfortunately a little too spicy for me. When in Korea, eat ALL the Korean BBQ you can! My personal favourite is this Korean BBQ restaurant located in Hongdae, The 통큰구이에서만드는. I don't think they have an English name even though the website says "TTong92", but one perk of this restaurant is that the prices are for all-you-can-eat buffet and they're really affordable - only about 12,000 won (SGD$15) per pax. I love their marinated steak cubes! Another one that I tried this time round is Piggy Bank Stone Grill Korean BBQ (pictured below) which is very popular amongst locals and tourists alike. This however, is a tad more expensive as it's not an all-you-can-eat restaurant and personally, I didn't like this as much as I prefer my BBQ meat to be marinated. This is Charlene's favourite Korean BBQ restaurant in Seoul and you can also find lots of good reviews on Google so do give it a go if you can! If only Singapore looks half as adorable as these stores in Seoul! 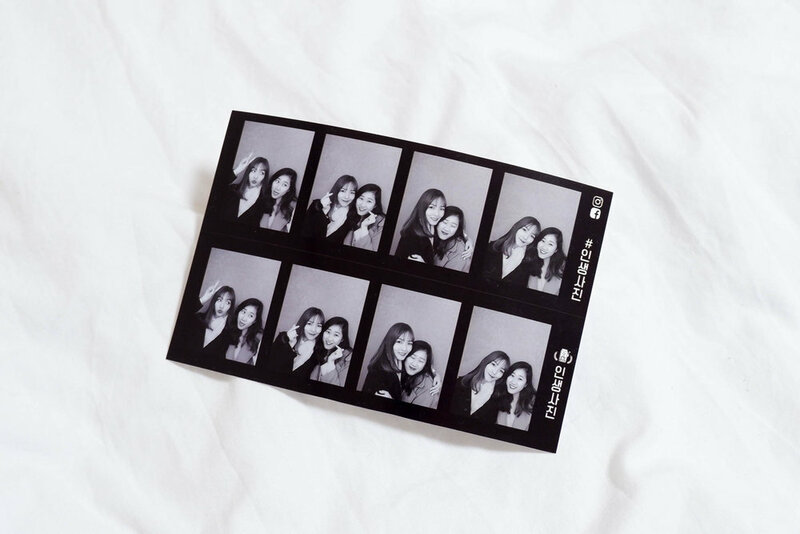 As our Airbnb was located at Hapjeong and just a stone's throw away from the shopping streets of Hongdae, Charlene and I walked to Hongdae on most days. We chanced upon quite a few cute store fronts like the Rolarola store that's entirely decked in pink, and couldn't resist taking a few photos for the gram. Another iconic building along the Hapjeong-Hongdae area is the Castle Praha, an ancient-looking castle that looks tacky and extremely out of place alongside all the hipster stores. You'd be surprised that this isn't a building from the ancient history but actually a Czech restaurant and bar that's specially designed to resemble the Prague Clock Tower Castle. Another place in Seoul that holds special memories for Charlene and I is the Hangang River. We'd spent most of our time there during our previous trip in Seoul together so naturally, this was one place we wanted to revisit. This time round, we opted to go on a river cruise as it's something new to us! We booked our Eland Hangang River Cruise via Klook and opted for the 'River Music Cruise'! Took some touristy photos as usual because Han River is truly beautiful. During our previous trip in Sept 2016, we mostly visited Han River in the afternoon so this was our first time there after the sun set. The place's filled with lots of fairy lights, heart-shaped decors and photo walls etc - very romantic for a couple, I'd say! If you're not a fan of jazz, you can also opt for the Story Cruise which is available at multiple time slots each day and I read that you even get to feed seagulls! There's also the Fireworks Cruise which is available only on Saturdays which unfortunately, we had to give it a miss as we weren't going to be there on a Saturday. Travel tip: If you're planning to go for unique activities and experiences like the Eland Cruise, do plan your itinerary ahead of time! You can pre-book activities for your trip through Klook so you don't have to worry about not securing tickets of a specific time slot etc. Klook is also super reliable as they're the official partner of official attractions worldwide, so there's no need to worry about being scammed by local 'tour agencies'! Back in 2016, we went on one of those duck boat rides and enjoyed the sunset while floating in the middle of Hangang River. This river will always have a special place in my heart! And that's a short summary of my week in Seoul! So sad to leave but I know I'd definitely be back soon. Hopefully this post would be helpful for some of you who are looking to visit Seoul! Also, if you're traveling during this Sakura season to either Seoul, Japan or Taipei, you might wanna check out some of Klook's cherry blossom special promotion here! P/S – If you have any questions about the places I went to, food I ate, stuff I bought, places I recommend in Seoul etc, please do drop me a DM via my Instagram (@nsybrenda) or drop me an e-mail! Spent a good one week in Korea with Korea Tourism Organisation learning more about the beauty and wellness culture in Korea. Here are some of the best beauty services that I managed to check out and highly recommend! Visual documentation of my short trip to Hong Kong late last year.